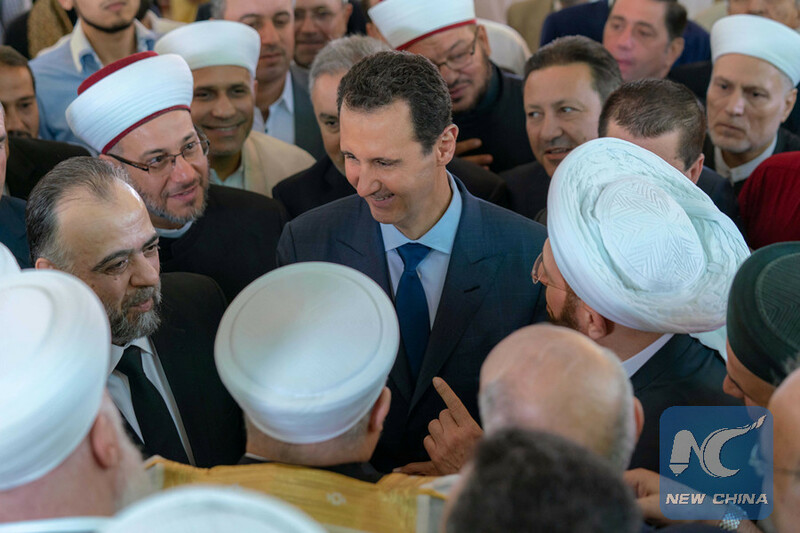 The president performed the prayers along with ministers of Syrian government at al-Rawda Mosque in a square under the same name in the high-end Abu Rummaneh neighborhood. Khudr Shahrur, the head of the Religious Endowments of Rif Damascus Governorate, led the special prayers. The Imam said after the prayer that "Mr. President, you have led the ship to the safety shore with wisdom and ability as you were the skillful shipmaster. The people are behind you hand in hand to build the glory of Syria." His remarks come as the Assad administration has made strides in the battles against an array of rebel groups, including ultra-radical ones such as the Islamic State (IS) and the al-Qaida-linked Nusra Front. The Russian-backed Syrian army has made recent successive victories almost capturing the entire southern region after securing the capital Damascus and other key areas. The major rebel stronghold remains in the northwestern province of Idlib, where an imminent military operation could be around the corner. Other than that, the rebels are holding some pockets in the northern countryside of Hama and some desert regions in the north near border with Turkey. As for the Kurdish-led groups, negotiations have been taking place between the Kurds and Syrian government to a reach a peaceful settlement for the Kurdish-controlled region in northeastern Syria.